Polished concrete floors are the ultimate alternative to the traditional hard surface flooring materials, polished concrete floors will outperform any commercial or residential alternative floor covering. With the demand of exceptional durability and minimal maintenance, a mechanically polished concrete floor sets the benchmark very high. 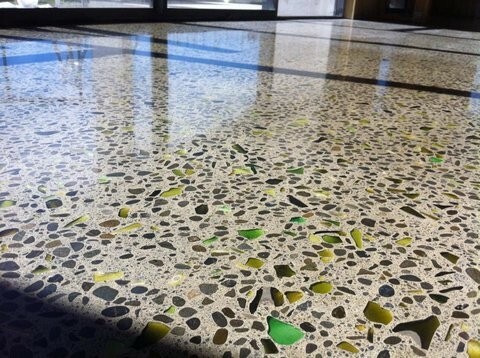 Polished concrete is considered a good sustainable flooring option due to the use of the materials already present. Most modern buildings are built on a concrete slab, polished concrete eliminates the energy and material consumed by applying a floor covering. It is something to consider when building or modernizing towards a more green solution. Existing concrete flooring can be transformed just as well as a concept polished concrete floor, though there are a few points which need to be noted and understood when choosing this. In most cases the concrete was not laid originally with any intention of being polished concrete. 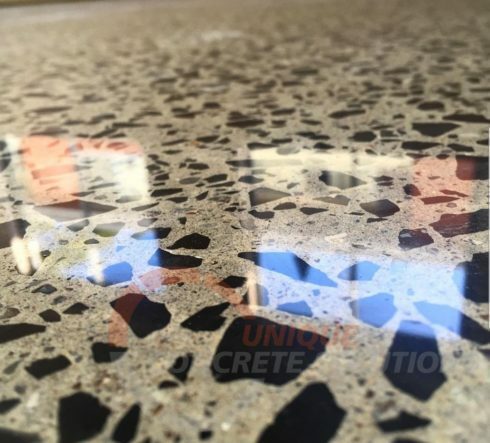 It is likely that the existing polished concrete finish may display inconsistency of aggregate exposure, concreting tool marks are often as well as stains on the surface may show more clearly at the finishing stages of the polished concrete procedure. These variances can actually be a positive thing and can add individuality or character to the floor, though for clients seeking more consistency of aggregate throughout the surface, need to be a deeper grind of the existing concrete to achieve the best polished concrete result. 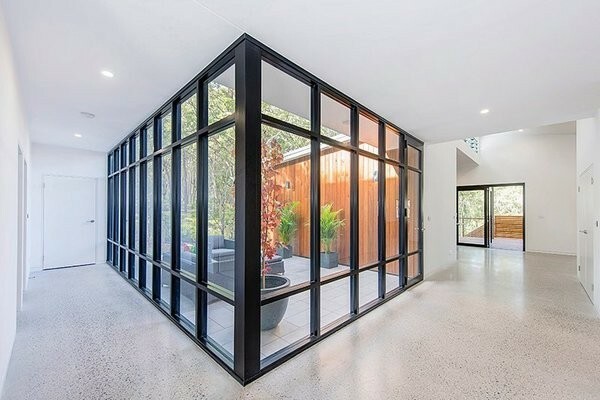 When selecting polished concrete as a flooring solution, positive attributes become apparent such as, natural light reflection helping minimise energy costs. Low maintenance, as well as a hygienic floor surface. Aesthetically polished concrete can sometimes take on the appearance of a granite floor, or a natural polished stone finish, it’s seem-less look has when polished has great appeal. 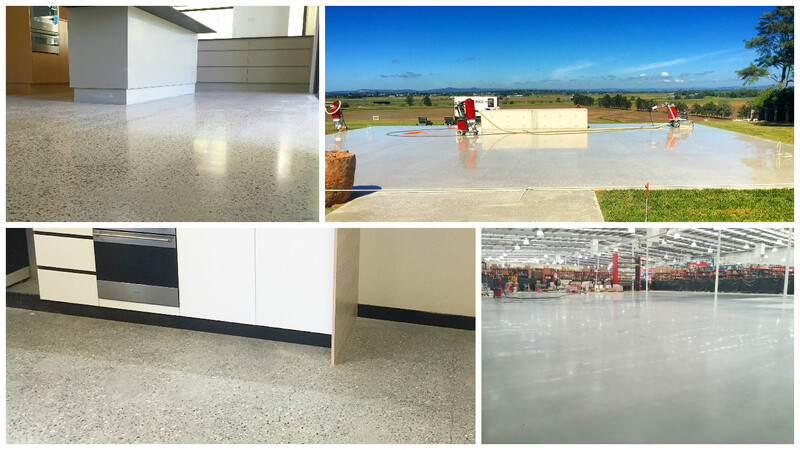 Polished concrete also reduces dust mite and allergen problems, it does not support mould growth. 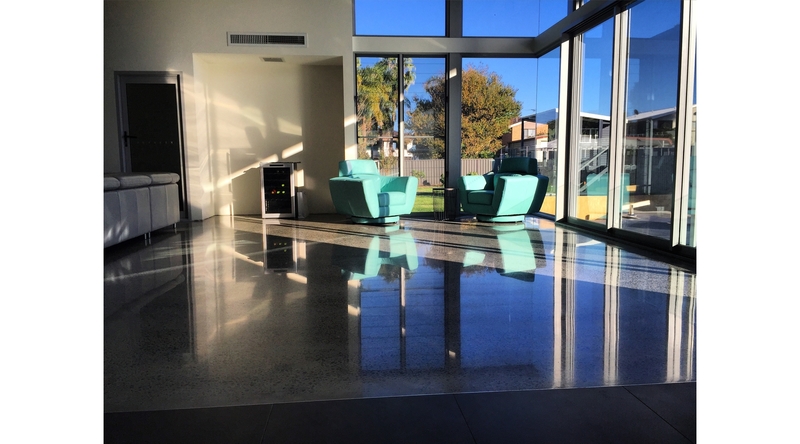 Anecdotal evidence suggests highly reflective polished concrete reduces lighting needs and improves natural lighting. Polished concrete flooring is hard wearing and will not chip, dent or tear like softer surfaces such as timber, tiles, vinyl and carpet. Polished concrete floors are low-maintenance, as they are more durable and easier to clean than many flooring options. Polished concrete floors are however sensitive to certain high acid/alkaline cleaning solutions, polished concrete does require a neutral Ph cleaner, being a safer alternative than harsh chemicals.